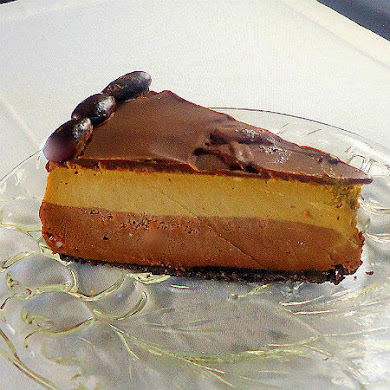 From the kitchen of One Perfect Bite...Adventurers climb mountains because they are there, folks who love good food experiment with ingredients for the same reason. My first encounter with blue cornmeal was a dirty looking chip with no cache. It looked terrible but the flavor wasn't bad. While it was grainier than its yellow or white cousins, it was sweet and hearty and had the lingering taste of earth about it. 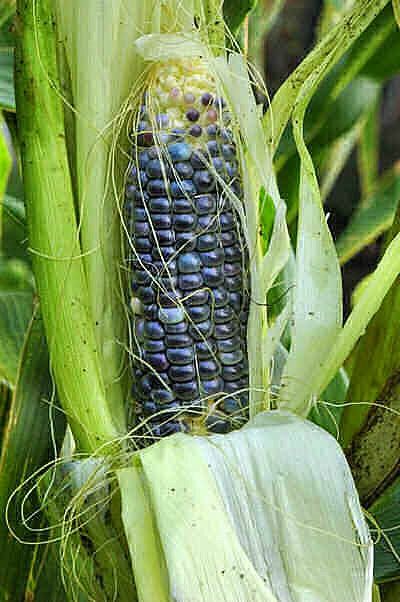 The Native Americans of the Southwest call blue corn Hopi corn and it has spiritual importance to them. It represents the rising sun and the beginning of life, wisdom and understanding. Blue cornmeal comes from the dried blue kernels of corn grown on plateaus and mesas in New Mexico and Arizona. It's not always a true blue and when it's on the cob it has a hue more purple than blue. When ground it appears to be a very pale, almost white, lavender that on close inspection is flecked with grains of blue that are photochromic. The picture to the left has not been doctored in any way. It was taken at noon on a very sunny day and this is what the camera saw. I've been working on Southwestern-style meals for a family gathering planned for later this summer, so it was a natural progression to begin experimenting with blue corn. When I found an old Bobby Flay recipe for blue corn muffins I was hooked and this is what my first foray into the world of blue corn produced. I can't tell you how much I enjoyed these. I will make them any time I can - even for breakfast. They are packed with flavor and have a wonderful moist crumb that's hard to resist. I really hope you'll try these. They are down-home wonderful. 1) Adjust a rack to middle-third of oven and preheat to 400 degrees F. Grease a 6 slot muffin pan with non-stick vegetable spray. Set aside. 2) Melt butter in a small saucepan; add onions and garlic and cook until soft. Set aside to cool. 3) In a large mixing bowl, combine milk, eggs, bell pepper, jalapeno, corn and cilantro. Whisk in butter mixture. Set aside. 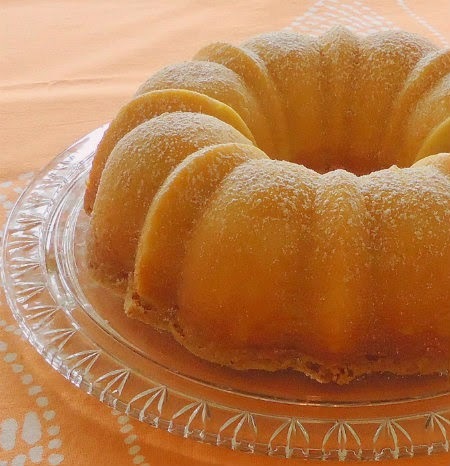 4)In a separate bowl, combine cornmeal, flour, baking powder, soda, salt and sugar. Whisk to combine. Mix into the liquid mixture. 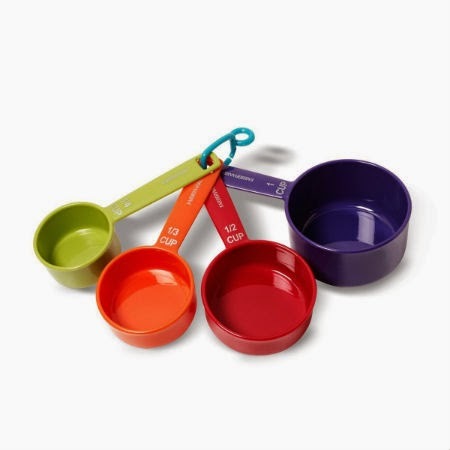 These look wonderful -- I've never used blue cornmeal either! I'll have to give it a try! This is a unique and fascinating food to me. I must try this! I think this is just awesome! Oh my goodness, I just have to find some blue corn! These are beautiful, I love all of the wonderful colors inside! I know my husband would love these too. Wonderful choice for Blue Monday! Did you find the blue corn and where? I suppose the blue corn meal can be purchased over the internet? 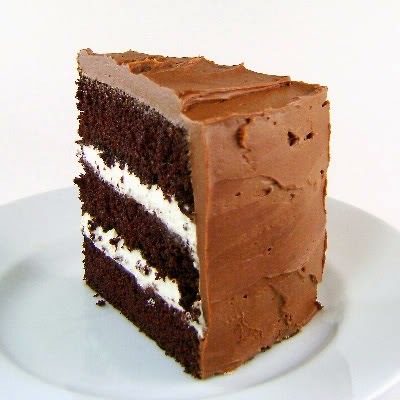 I wish I could taste right now. Susan, we have a small bodega in our area that carries blue corn in the late summer. Very little of it makes it to market because most of it is raised to make masa. The internet is a great source for blue cornmeal but you can buy it in Spanish/Mexican markets, Whole Foods of Market of Choice. I love how it looks inside... the red of the bell ppr, the yellow corn, it's a beautiful muffin and I'm sure it's delish! So cool! I have never baked with blue corn. What striking colour! Your blue muffins look so delicious and will be fun for a family gathering. They would spark a lot of conversation at my house. I might add a little dab of pepper jelly along with the butter. Yum. wOW!!! That looks FANTASTIC! And the nutritional info is superb, I'll bet, compared to regular cornmeal! My favorite color, one of my favorite foods, FABULOUS!! I am going to see if I can find some blue corn meal at Whole Foods because these look amazing. Thanks for adding the interesting blue corn comments as I found the history so interesting. My cooking light club would love these muffins. Your muffins look delicious. I just bought blue cornmeal for an enchilada casserole and I think I now know what I will be doing with the extra! oh what a lovely blog you have!!! 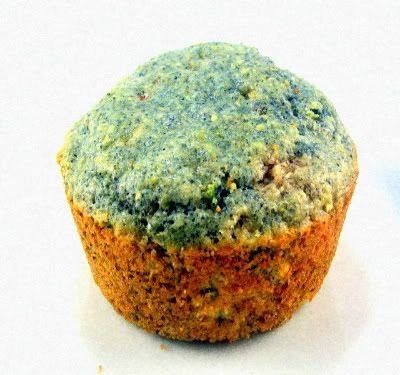 i am going to take some time and look at all your yummy yummy images from your past post...these blue cornmeal muffins look amazing!!! Thanks for leaving such nice words on my blog! I wonder how it taste like?? these look great never heard of blue corn is it easy to find? I love the sound of these, Mary- I don't know if I can find blue cornmeal here, but I'm sure going to look! I'd love to try these! Gals, Whole Foods and Market of Choice both carry blue corn in their bulk sections. It can also be ordered on line. 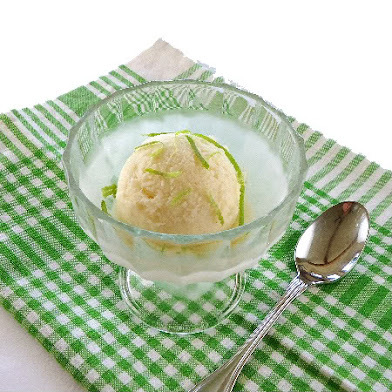 As to its taste - a bit like yellow cornmeal but with an earthier flavor. Trust me...I'm not into strange stuff. You will really like this. They are so colorful and pretty! I'd have to mail order blue cornmeal because I have never seen it anywhere around here. Actually, I've never seen blue corn either! That is awesome and looks totally tempting. I just the love that color. Ooo Mary these are beautiful! I can't wait to try them, and that corn shot is stunning. ooh, I've never seen blue corn in "person"...these are so colorful! I bet those are DELICIOUS!!! 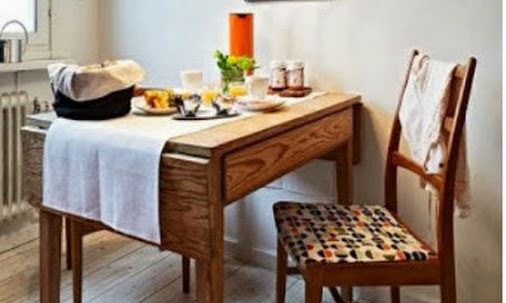 Your blog makes me hungry.. breakfast time! I love corn muffins and those look scrumptious! Perfect for a 4th picnic. Thanks for the idea. By far, the coolest corn muffin ever! What a yummy-looking muffin! I've never seen such a pretty head of blue corn before! Thanks for sharing and have a Happy Blue Monday. Mary, I always like to drop by to see you and see what you might be cooking. You never disappoint. I love blue corn chips, but I have never had blue corn muffins. These look GREAT! I can only think of one possible source near me. I've bookmarked your recipe in case I am successful! I think they mix it with ash as well. Several years ago I purchased some blue corn meal and made a type of cornbread with pine nuts in it. 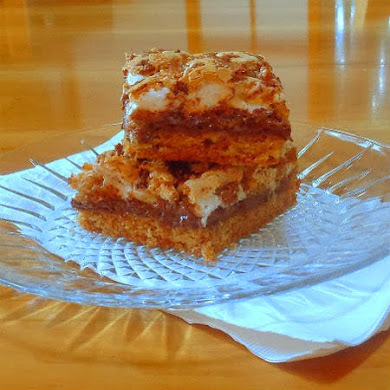 We all loved it and I have been thinking of making it again. Now I am inspired! Thanks Mary. This looks like a fun recipe. I've had blue cornmeal chips... so next corn muffins! I've not seen the blue corn before. We lived on the Navajo reservation in Tuba City, AZ for about a year, a long time ago. The Hopi reservation was just across the highway. Almost everything is spiritual to the Indians, it seems. We really enjoyed our time there..I spent most of my days, driving around looking for rugs, pottery, jewelry..Had such fun. I really want to try these muffins and think I will go right in and make some for our dinner tonight. Oh and have you ever had Navajo Tacos ? O, Honey !! oops, meant to say I would have to use regular corn for these muffins..hope they will be good, anyway!!? 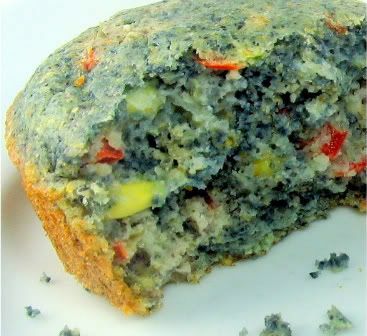 bj, the muffins are delicious when made with white or yellow cornmeal, but the blue corn adds an earthiness that is missing from muffins made with white or yellow meal. What a great blue post. The blue cornmeal is sooooo COOL!!!! Beautiful. I have an aunt who lived in California and she used a lot of blue cornmeal. 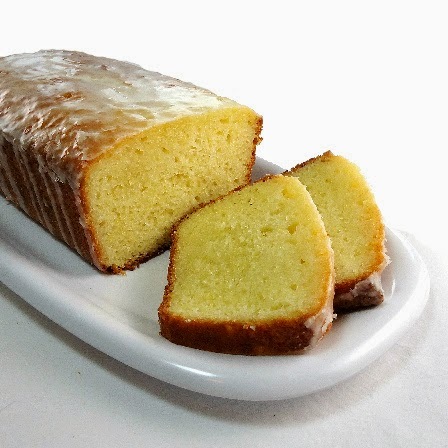 I love Mexican cornbread. I have to try out your recipe. I've been enjoying blue corn meal for years now. I think my very favorite recipe is for blue corn waffle chips - spicy chipotle pepper and made in the thinner heart shaped waffle make I have. 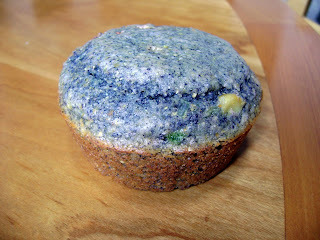 Love the blue corn muffin look - I think they're beautiful.